In February of 1998, I assembled a group of independent professionals and other independent-minded folks who met in Seattle once a month or so to share a meal and some camaraderie. I stopped organizing regular gatherings in February of 2013 (15 years seemed like a pretty good run), but rogue noodlers still meet in Fremont, Philadelphia, and the Bay Area. The Fremont Noodle House Group is an eclectic and lively collection of massage therapists, architects, artists, graphic designers, musicians, playwrights, publishers, editors, writers, film and video producers, public speakers, drum and dance teachers, graduate students, world travelers, entrepreneurs, career counselors, financial planners, consultants, and other interesting folks. We meet with no set agenda, just a common interest in occasionally sharing a meal with fellow independent-minded professionals. 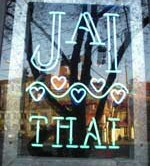 We used to meet at Jai Thai (in Fremont, just up the street from our original location). Until mid-2001, we met at the Fremont Noodle House, hence our name. Unfortunately, like so many other Fremont institutions, the original Noodle House met the wrecking ball. Here’s a story about our last meeting at the Noodle House. The Everett Herald ran a column about us a while back. Written by our own Eric Zoeckler, the column demystifies the work-at-home lifestyle. Our members do all kinds of interesting stuff – translation services, marine safety, massage, management consulting, circus arts – you name it, a noodler probably does it. Here are links to some noodlers’ web sites. If you are an independent professional or just independent-minded, drop me a note and tell me a bit about yourself and I’ll add you to the invitation list.